This is a first – for me at least! I have been offering live webinars on a variety of topics but not everyone is free to participate at the appointed time, so I felt there was a need to make these webinars available on a permanent basis. Here is the first one! The topic of anxiety was the one most people asked me to touch upon first because it is such a widespread and growing concern for many people who live or work with animals of different species. Here it is! In this “evergreen” webinar we take a look at what anxiety is and how it may affect animals both in terms of their physiology and behaviour. 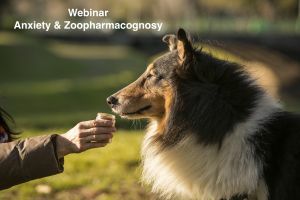 Then we explore the many options which zoopharmacognosy has to offer to help us and our pets cope with this often stressful situation which puts a strain on the whole family or environment. I hope you will enjoy the webinar and find it useful.